I recently read this article in the Huffington Post that suggested that children are most likely to look like their paternal grandmother. It spotlighted an artist, Ulric Collette, who had done a series of rather uncanny photos after a geneticist told him children will look most like their grandmothers. The photo of his mother and daughter is remarkable. But, beyond just being interesting, it got me thinking about the likelihood that I looked like my father's mother, whom I never had the chance to meet as she died in 1968, ten years before I was born. She was only one month from turning 50 when she died of breast cancer that metastasized to her brain. My father was only just 15 years old. I was reminded that this last summer, while I was in California visiting family, I had the opportunity to take some scans of pictures I had never even seen before. My Aunt Pam, my dad's only sister, moved this last summer from a house she had been living in for the better part of my childhood. In the process she came across a box of old photos, many of them of my grandmother. Up until this, I had only seen just one picture of her and she was quite a bit older than these. The pictures were brought to my folks place, where I made sure to get scans of all of them. I don't know when either photo were taken. 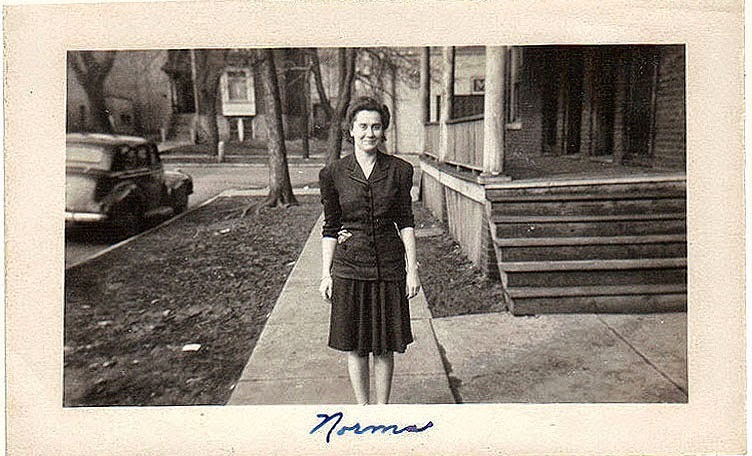 The second image, the one labeled "Norma," was taken in Illinois, so it had to be sometime before 1955 or so because that's when they moved to California--though I'd say it was much earlier. I scanned a lot of others, but these two are my favorites. I love everything about them. Earlier this year, then, when I came across the article about looking like your grandmother, I started looking for information about her and thanks to ancestry.com I was able to find quite a lot. Her name was Norma Mae Krippendorf (Rhodes) and her birthday was February 18, 1918. She was born in Illinois, but her parents were from Germany (father) and Prussia (mother)--which was, by 1918, a part of Germany (they confederated as German states in 1871). I also learned that she had several siblings, whom I'm pretty sure I've never met, and that her father, William, lived until 1986 when he died at 102 years old. Her mother only lived to be 31 years old. She and my grandfather were both born in February and, interestingly, both died within a month of their birthdays (my grandpa died in early February 1999). The same was true of my mom's mother who died the same month she was born, in August. I don't know that we look alike, exactly, but I'm happy I took the opportunity to learn more about her. I'm grateful for having read the article that encouraged my curiosity. More than anything, though, I'm thankful that I had the opportunity to make copies of those pictures, since they're now all I have of a woman I never had the opportunity to know. Thank you Kristyn for taking the time to find this information. Your Daddy didn't even know anything about his grandparents on his mother's side...except for grandpa Will and that he lived in Kissimmee Florida at the time he died. I don't know when he moved there or why for sure. Aunt Pam says that the move was to be close to Pearl who was in an institution for mentally handicapped. But, I have to wonder how Pearl would have gotten to Florida, except that she went there with her father, since the rest of the kids lived or still live in Illinois. I know that your Grandpa was in the military during WWII, so maybe he was stationed down there and met Norma there? I'm guessing her family was from that area, that is they moved there from Germany. I know that Norma had been married before, but had no children from that marriage and it was a very abusive situation. Your grandfather Rhodes was also married before to a woman named Amber and together they had a son named Gene Paul Rhodes, but, other than his mother's name and his name I don't know anymore about him. I believe that that marriage was when Grandpa was in the military and was pretty young and when it ended, he was not allowed contact with Gene. Grandpa also claimed to have another child in the Phillpines...but we know nothing about him...name or mother's name. That one would be very old if still living as grandpa would have been very young when that child was born. All we know is that he was a male child. I think it would be interesting to find info about Grandpa's other two children. Grandpa had a picture of Gene as I recall, but I don't know what happened to it. I think Aunt Genivive had given it to him, since they had knowledge of his life...but, I don't know if she is still living for sure, Aunt Pam says she is, but, I don't know how reliable the info she got is. By the way honey, today is the anniversary of the day your Grandpa Rhodes died...15 years ago. Thanks for the information, mom. My research says that Pearl died in 20010, but I don't know about Genevieve. I'm going to look around for my baby book, but I haven't seen it in years--I'm pretty sure I haven't had it since I moved to TX 15 years ago. I could barely finish reading this before I had to run over to a picture of my grandmother to see if I look like her. I knew I didn't, but I just wanted to compare both grandmothers. 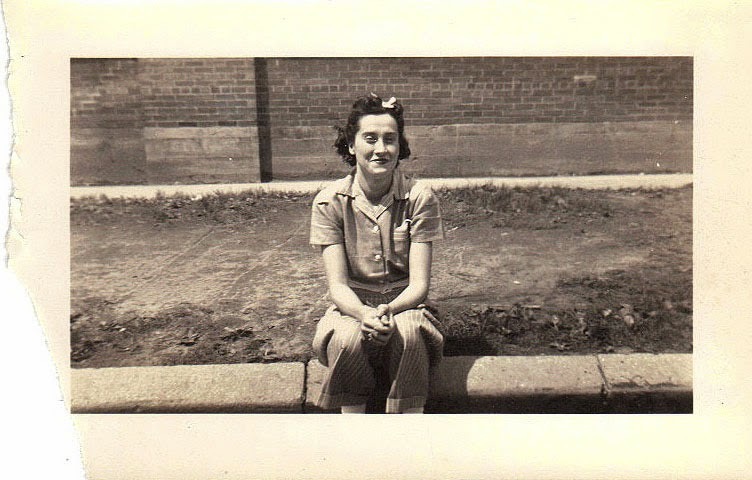 My paternal grandmother is petit, fair skinned, with light features. I'm amazonian tall, olive skinned, and dark features. We look nothing alike. However her wedding pictures looks exactly like a 2nd cousin of mine. So someone in the family got her good looks. It's so great to learn your family's history. My grandmother loves to do genealogy so she has a lot of history looked up on about our family. Some of it is really interesting (like I had a distant relative literally run off to join the circus--crazy!). So glad you got to learn a little more about her. It makes me think of my maternal grandfather, I don't know anything about him as he passed away when my mother was 16, so I never met him. I don't know how accurate the science behind the idea is, but it certainly made me think. The more I look at the pictures (I have others), the more I see a slight resemblance. But then, I would since she is my grandmother! I've always looked a bit like my dad's side, but I think, as I age, I'm starting to look more like my mom and her mother. It's certainly obvious that they're my parents, at any rate. When I was in my late teens, I was pretty genealogy crazy! That was back before Ancestry.com came along and made it possible to access all sorts of records. I had a box of research I'd done over the course of several years. When we moved once, after I moved to Texas, it was lost. Thankfully, there were no original pictures in that box, but there were some copies and they're lost. I was not at all a happy camper when I realized we had lost it. Now, I have a lot of scanned pictures of family, but I have zero idea who any of the people are. I may have to get my mom to tell me, but even she doesn't know who some of them are. I think that's the way it is with family, things get lost over time, people get lost. Your grandmother Norma is beautiful! I love vintage photos. There is something so wistful and longing about them. I guess the term for that is "nostalgia." I love Ancestry.com--they traced my entire lineage, which was pretty awesome since my bio-dad's side of the family is a mystery to me. Glad you were able to learn so much about your family...it's a pretty cool feeling.